Samsung announced the company’s first foldable device “the Galaxy Fold” at its Unpacked event on February 20. The device has a release date of April 26 and will be offered in the U.S by only AT&T as well as T-Mobile. Samsung Electronics will also launch its foldable smartphone the Galaxy Fold with 5G connectivity in South Korea. The Galaxy Fold was initially preparing based on 4G LTE connectivity; later it changed to 5G according to its strategy of becoming the most premium product of foldable. 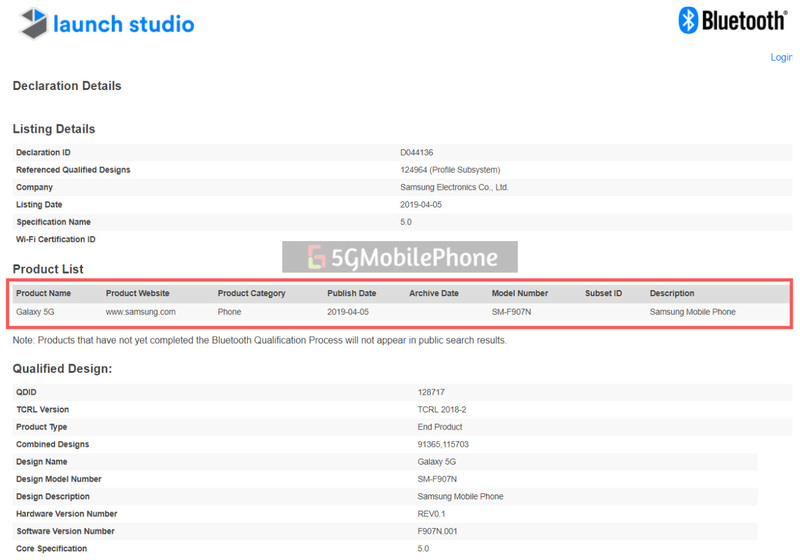 On April 5, the Galaxy Fold 5G with SM-F907N model number has passed the Bluetooth SIG certification which confirms its existence as well as indicates that the launch of the smartphone is around the corner. The version of the Bluetooth module is 5.0. SM-F907N model number is compatible with Samsung Galaxy Fold’s 5th generation mobile communication system, and it is expected to launch as Samsung Galaxy Fold 5G. The end of the model number is N for Korea which indicates that the Galaxy Fold 5G to launch in Korea soon. It is expected to be released (the only 5G version of Galaxy Fold) around May 2019. South Korea’s mobile telecommunications carriers SK Telecom, KT, and LG Uplus are also expected to sell on a self-sufficient basis. The Galaxy Fold for the 4G LTE model will be priced starting at $1,980 in the U.S. However, In Korea, the 5G version of the Galaxy Fold will be priced between 2.3 million and 2.4 million won; Samsung Electronics Co-Chief Executive DJ Koh told at a press event. Koh further explained, “the price of 5G chips is very high than those of 4G in South Korea; so the price will be high for the 5G version of the Galaxy Fold”. The main highlight of the Galaxy Fold is that it has two displays that can transform from phone to tablet and back again. The outer display comes with a 4.6-inch HD+ Super AMOLED panel with a 21:9 aspect ratio while the inner display features a large 7.3-inch QXGA+ Dyanic AMOLED canvas with a form factor of 4.2:3.